DAN BLACK has written and edited hundreds of articles on Canada's military, past and present. He is the former editor of Legion Magazine. Dan lives outside of Ottawa. JOHN BOILEAU is a retired Canadian army colonel and author of twelve books and 500 articles. He is a frequent commentator on military issues for radio and television and a lecturer to service organizations and historical societies. In 2010 the Minister of National Defence appointed him Honorary Lieutenant-Colonel of The Halifax Rifles (RCAC) and in 2014 he became the unit's Honorary Colonel. He lives in Nova Scotia. GENERAL JOHN de CHASTELAIN is a former Chief of the Defence Staff for the Canadian Armed Forces and an ambassador to the United States. "History is peppered with stories of young men who joined up when they were under age. 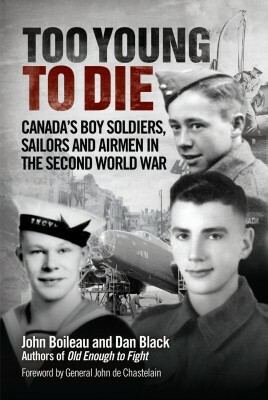 Boileau's book takes a look at a huge number of young men aged 14+ who joined the Canadian Armed Forces to fight in the Second World War."